For any of you that have been reading Letters From A Tapehead over the last year or so, you may have noticed an occasional review or two for new music either released or reissued on cassette. The underground’s favorite format has persisted to exist even though tape decks and boomboxes are scarce and the technology itself has been written off as obsolete. Cassette-centric labels have sprung up and, along with the LP, basically defied the push by digital media to dominate the marketplace with convenient, mediocre MP3s and wipe out the production of tangible, high quality formats. Okay, we’re talking cassette tapes so, realistically speaking, the MP3 isn’t in any danger of losing the battle. But, the appeal here is that the cassette culture of years ago is finding its second wind, tape swapping and marketing with regard to underground and local music scenes being, in its essence, the first wave of what was to become file sharing. 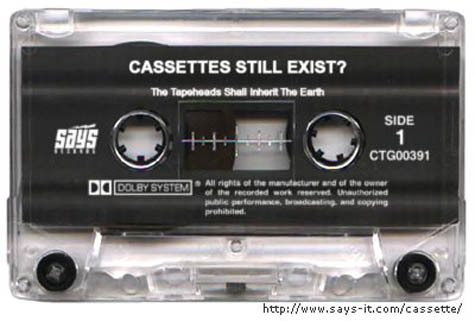 With this in mind, I’ve been locating and compiling resources with something to say about tapes and their continued importance. My findings will be articulated into an article for No Ripcord. So, to anyone reading this, I’d like some opinions. If tapes had an impact on you, or if you know of any artists, record store employees or owners or record label proprietors in some way connected to new music released or sold on cassettes, please either write to me or comment. I’d like to include quotes and some perspective from music fans and anyone with a fondness or nostalgic attachment to cassette culture.